Its that time of year yet again. 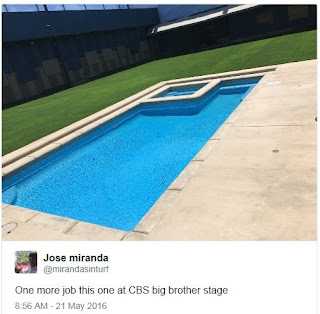 Wednesday, June 22nd is the start of the 18th season of the USA version of Big Brother. Here is what I know - which ain't much to be honest. There is a NEW POOL! Yeah, that's confirmed because the people that put in the new fake grass in the backyard tweeted a picture (and then pulled it a few hours later). Wanna bet they got an ANGRY call from someone at the show? We also got a few other pictures of the house 'leaked' via facebook earlier this week. The theme seems to be of an international flavor with France, England and Japan getting nods from the house decorator. Other than that - who knows? Rumors are all over the place, as usual. The cast will be introduced to us via the live feeds on Monday, June13th. Then on Saturday, June 18th, Scott, Colette and myself will break down the HG interviews and let you know what our thoughts are on the upcoming season on our Big Brother Gossip Show LIVE. CBS is also running a Big Brother Marathon through CBS All Access. I guess some folks are enjoying watching them in order but you know you can watch every episode anytime you like with CBS All Access so its a bit hard for me to get fired up about it. 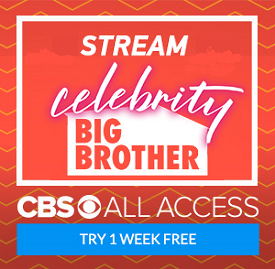 HOWEVER - if you want to check it out and sign up for the feeds early - you can get a one week FREE trial of CBS All Access by clicking on any banner on this site or HERE (and thanks for your loyalty!). Looking forward to the podcast!